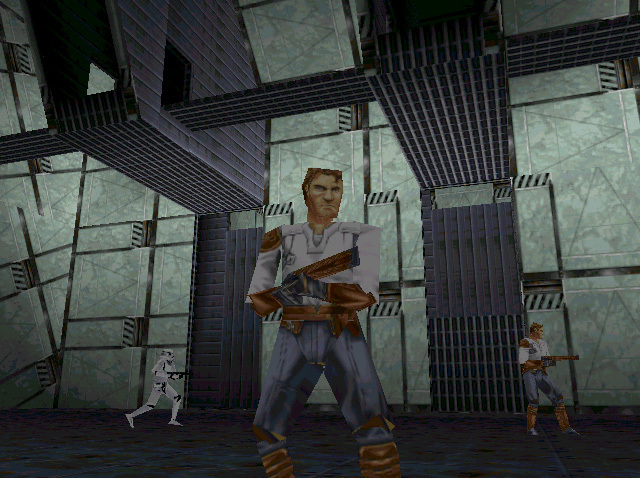 Dark Forces II: Jedi Knight, is the ultimate sequel to Dark Forces. It's a "Doom" like game, and I usually get bored of these kind of games very quickly, but I'm still playing this one. I think what makes it so fun is that you can use the Force to do many things, such as pull the weapons away from the enemies hands. You can also use the Lightsaber, which is a really fun weapon, because you can even block blaster fire just like Luke does. As you get through the game, you gain more experience, and you come to a point where you have to choose between being a Dark Jedi or a Jedi Knight. Overall, the game is excellent, and although the graphics aren't as great as many other games, such as Quake II or Hexen II, it makes up with great replay value and just pure fun. You can get more Dark Forces II info at Lucasarts' Official Jedi Knight Site.